MySQL is one of the most popular database management systems. It is most often used for web-based application and it is also one of the main components of the LAMP (Linux, Apache, MySQL and PHP) open-source web application stack. 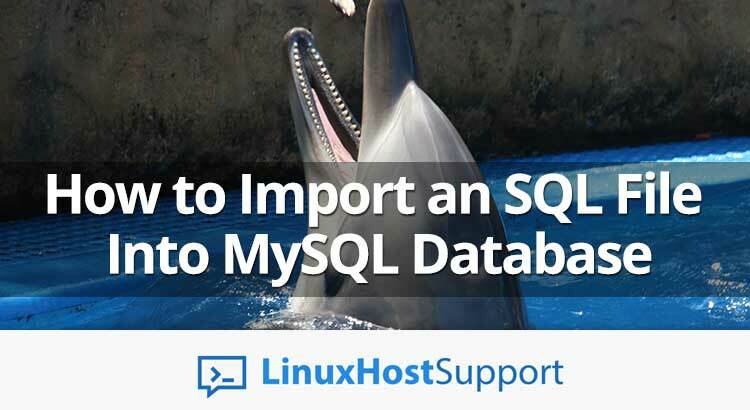 In this tutorial, we will show you how to import an SQL file into MySQL database on a Linux VPS. This will help you when you need to transfer your database from one server to another or to restore a database backup. That’s it, you can now connect to the MySQL database server as the MySQL root user using your new password. We will now show you how to import an SQL file into an existing MySQL database. Your database is now ready, and we can now import the SQL file. You will be asked for the password of the database user to which the database is assigned. Enter your database user password to finish the import. With this, the BackupDatabase.sql file has been successfully imported. Again, you will be asked for the database user password, and it will create an SQL file of your database which you can store it as a backup, and import it later if needed. Of course, you don’t have to import your SQL files in MySQL, if you are using one of our outsourced Linux server management services, in which case you can simply ask our expert Linux admins to help you. They are available 24×7 and will take care of your request immediately.